I have this habit of remembering shops that I see when I'm driving. Lately, I've been taking note of nail salons that seems interesting to visit. When time and budget permits it, I schedule an appointment or simply go there hoping I can be accommodated. 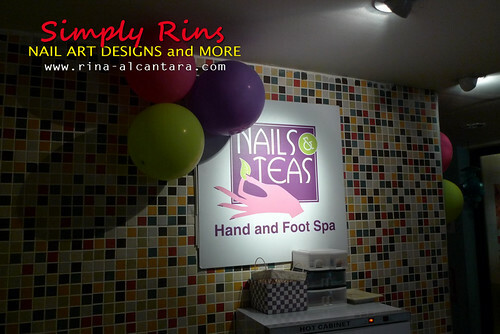 Nails Teas Hand and Foot Spa is a nail salon I saw a few months back at Timog Avenue, Quezon City. Last weekend, I had time to try their services. The balloons served as decorations when they celebrated their 1st year anniversary earlier this month. The nail salon is slightly dim when I entered. Immediately on the right is a small waiting area for clients and straight ahead is the reception area. Since it was my first time here, I quickly searched for the list of services, which was not so hard to find since it was in the middle on top of the counter. Cost of packages starts at Php330. Nail polishes and menu of services found on the receiving counter. I was first asked for the package I wanted. I chose Pamper 5. Next, I was asked to choose my nail polish. Selection was pretty good. They have Orly, OPI, and Essie nail lacquers. 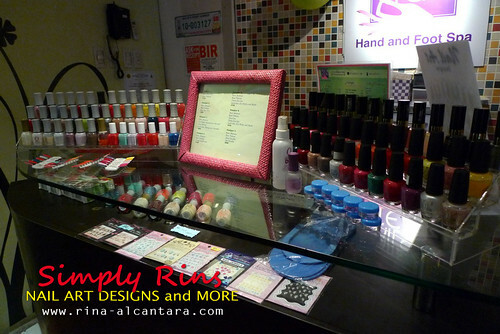 They even sell some Orly polishes and a few nail art accessories like stickers. On top of the counter, you'll also see polish swatches. This is the first time I've seen one in a nail salon. 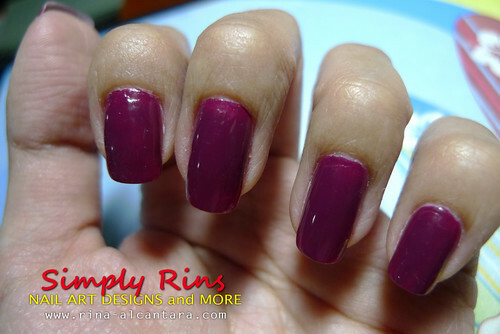 I think this can be very useful to clients who would like to see how the polishes look like when applied. I wasn't so impressed with the coaches. 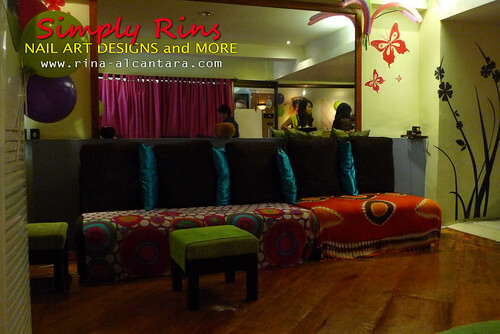 Both sides of the nail salon had a long sofa without arm rests that can approximately accommodate 3-4 people at a time. If there were 4 people, you'll be almost elbow to elbow with the one next to you. I experienced this during my stay there and from a personal stand point, this takes makes me quite uncomfortable. It's not so relaxing when you need to restrain your actions and have to pull your bag very near to you just to make more room for others to sit in. Will something like this bother you during your trip to a nail salon? Tools were neatly arranged in an open box. Almost after choosing the package I wanted, I brought out my camera and starting taking pictures. When I sat down, a nail technician who was about to do my manicure told me it was prohibited to take photos inside the nail salon. When I asked why, she simply said that it was the owner's instructions. I was about to oblige but when she mentioned that the owner was the one sitting in front of me when I arrived, I quickly argued that I was taking pictures when the owner was still around and didn't reprimanded me. So, I continued taking pictures. While the nail technician was removing my current nail polish, a regular customer came in and openly stated that she was in a hurry. Unfortunately, there's no nail technician available and she had to wait. I heard the client talk to my manicurist, feeling quite sad that she's preoccupied during my nails. Apparently, she's a regular customer and favored the one that was with me. I quickly said to my nail technician that it was fine if she did the other client first. Why? My nail technician quickly responded, "This will just be quick." when the other client expressed her sadness that her regular manicurist is currently preoccupied. I sort of panicked because I felt with the remark and the fact that she reprimanded my picture taking will result to a bad manicure. So I just had to let her go. If the client who came in after me had an appointment, then I would give up my slot happily since I was a walk-in customer. Maybe it's just me but having to experience such scenario is personally disappointing. As they say, first impressions do matter. I wouldn't want a nail technician who's not happy to do me. Portable lamps at Nails Teas. 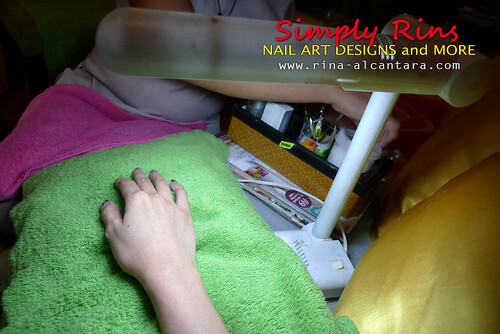 To compensate for the slightly dim atmosphere at Nails Teas Hand and Foot Spa, nail technicians use portable lamps, which I personally believe every nail salon should have. There's nothing like a well-lighted area whenever a nail technician is at work. If they can see better, they can do their work better. Sometimes, ceiling lights are not enough, especially when you're working with something so small, like nails. Throw pillows compensate for the lack of arm rests, which are perfectly okay as because I felt comfortable and I think that's the most important. My pedicurist ended doing my manicure as well. I have no complaints. She has the softest hands. From removing my nail polish to cleaning my nails. She was very thorough too. If you decide to visit Nails Teas, I recommend you ask for her -- Bing. The only thing I didn't like is how she applied my nail polish. I brought my own polish that day, Zoya Savita. I always intentionally want a dark nail polish when I visit a new salon because I wanted to see how they'd apply it and clean excesses on my skin. Lighter polishes are easier to clean. 1st coating was very near the cuticle area. The 2nd coating however, came too low the cuticle area. This resulted to an uneven application which is quite obvious when I look at my nails. I'm very particular about nail polish application because I'm a detailed person. I believe we are the critic of our own nails. It is but natural for us to always look them up close. And so to see my (your) nails unevenly polished is an eye sore. You could always ask your nail technician to repeat your polish application and inform her why. But that day, I didn't. I was pressed for time and since I only had 1 nail technician to do my manicure and pedicure, it took a longer time to finish the services I availed. I'd still recommend her though, since I'm more particular as to how my nails are cleaned and she did a really good job. 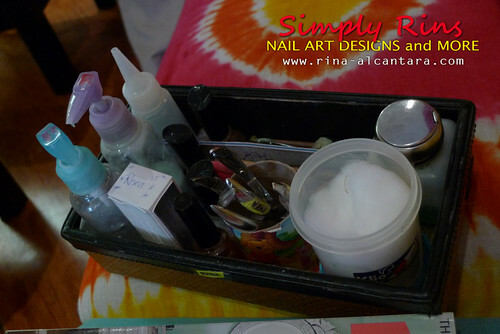 I can always redo my polishes at home. They have an ongoing promo. For every visit, regardless of service you avail, you'll get a stamp on your card (photo on the left). You'll get something FREE on your 3rd, 5th, and 7th visit. 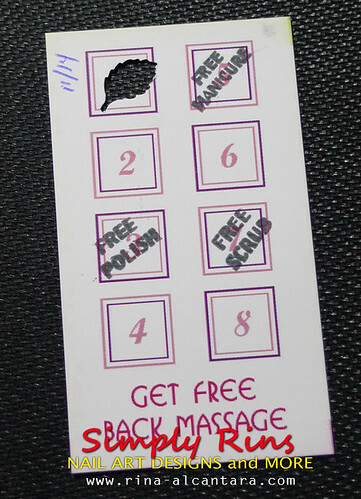 A free polish on the 3rd visit, a free manicure on the 5th visit, and a free scrub on the 7th. So don't forget to bring your promo card on your every visit. Nails Teas Hand and Foot Spa is located at Unit G G/F of Sir William's Hotel, No. 39 Timog Avenue, Quezon City. I suggest you book for an appointment to make sure you'll be properly accommodated. You may call them at Tel. No. 371-4333 Loc. 108. There are parking spaces in front of the salon and a basement parking is available as well. Their business card says that they're open daily, from 10:00am to 9:00pm. 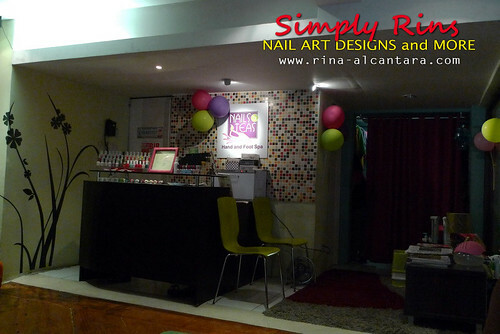 So if you're looking for a nail salon at Timog Avenue, I think this is worth checking out. Disclosure: I fully paid for all services I availed. My personal experience with Nails Teas Hand and Foot Spa may be different from yours. This review is entirely based on my personal insights. that was nice of you to give up your spot. i don't know if i would have. Hi, Enamel Girl! I was quite forced to do so. I enjoyed all my visits at nail and teas but i just cant understand their promo card which i think is not worth at all. Whenever I used that free/promos indicated on the card, the price of the services is much higher than the packages offered. what's the use of those free services when at the end of it you will pay more. Hi, thanks for this post. My friend and I will avail the voucher from metrodeal by the end of this month. The benefit of pain free foot massager therapy are helpful for our body.Thepain free foot therapy massagermight relieve stiffness and improve circulation by opening blood circulation.It also help relief pain and ger refresh our in long time work.So it's a best one healthy massager. This massage therapists Toronto uses slower, more-forceful strokes to target the deeper layers of muscle and connective tissue, in order to help with muscle damage from injuries. Love to see this type of post people now can understand how much important is foot massager. www.foottherapy.net in this site people may find their own choices and prices foot massager. Nice post. Let's give some concentration to your feet. Do you have thick, rough, discolored skin fold on your feet? They are called thick calluses on feet and are very common. If you want to remove them early, visit our site to know hoe to get calluses off by some easy home remedies.